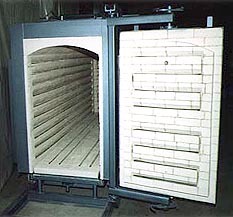 Since its introduction more than three decades ago, the UNIQUE Envelope Kiln has proved its practical usefulness in the firing of the world’s most valued ceramic articles. Available in a full range of sizes up to 120 cubic feet, this patented kiln design provides for high production in a minimum floor space. Special sizes and larger units are available as custom models. Standard models are available for 2000F for lower decorating firing, or 2350F high fire. The Envelope Kiln rolls on tracks to envelop ware placed on either of two stationary beds. This design innovation, with completely accessible fixed beds, permits rapid loading or unloading of one bed while the other is being fired. fast turn around time low breakage losses for even the most delicate materials. Heating coils are distributed over walls, doors, and beds. Firing is, therefore, rapid and uniform. Firing schedules may be easily adjusted from one cycle to the next as sales and production demands vary. attained in less than three hours. High temperature firing, sintering, or calcining times will depend on maximum temperature and loading. literature on Car Bottom/Shuttle kilns. structural steel members to form a durable, integral unit, finished in heat resistant paint. Interior – Lining of walls, beds, and arch roof consists of high quality refractories and multilayer insulation rated to 2600F. plate with heavy duty vise type door clamps. single program, six ramps/six soaks programmable controller. connectors. Easy access, vented sheet metal terminal covers. ready for operation after connection to power supply in accordance with instruction manual supplied and data shown on kiln rating plate. Adequate kiln building and foundation with clear access for location of kiln. Necessary electrical services for operation of kiln. Hoods, stacks or vents in building roof to exhaust waste heat and products of combustion. Envelope Kilns are provided ready for operation after purchaser connection to rated power supply (as shown in items 2 through 8 ) and provision for waste heat exhaust.